Ecouterre is an official media sponsor of the 2013 EcoChic Design Award. 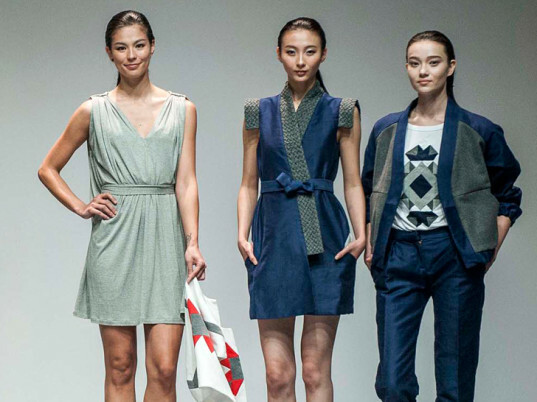 Fashion NGO Redress injected Hong Kong Fashion Week with a creative dose of high-appeal and low-textile waste fashion, designed by emerging sustainable fashion designers, in last week’s The EcoChic Design Award 2013 Grand Final. Never before on the doorstep of the world’s largest clothes manufacturer has textile waste ever looked so appealing. The EcoChic Design Award is our sustainable fashion design competition that challenges emerging fashion designers to create mainstream-appeal clothing with minimal textile waste. We first dropped the competition’s roots in Hong Kong in 2011 before our cross-continent gigantic growth in this fourth cycle to shepherd designers from Hong Kong, Mainland China, Taiwan, Singapore, UK, France and Germany for the 2013’s culmination at Hong Kong Fashion Week. The eight finalists each presented their six-piece collections, created using a combination of zero waste, up-cycling and reconstruction sustainable design techniques, to a high-tempo audience ranging from Hong Kong’s fashion glitterati and celebrities to government representatives and, of course, to an influential panel of judges that included Orsola de Castro, co-founder of upcycled-fashion label From Somewhere and London Fashion Week’s Estethica. Following what was our most outstanding grand final, Germany’s Karen Jessen was awarded the first prize, The EcoChic Design Award 2013 in Partnership with Esprit Winner, for her innovative use of the reconstruction design technique. “This eye-opening experience sharpened my perspective about the powerful position I have as a designer. This week has made me more determined to have a sustainable influence on the fashion industry,” said Jessen. Jessen was whisked off the catwalk, through a cacophony of media interviews and into a meeting with Esprit to discuss her upcoming designs for her “Recycled Collection by Esprit” for Esprit’s global retail in mid 2014. “We welcome Karen’s fresh perspective into Esprit’s design team. As one of the worlds’ leading fashion retailers, Esprit will pair our market force with Karen’s innovation to drive our sustainable fashion imprint in our global stores,” said Charles Dickinson, head of global quality management and sustainability at Esprit. In keeping with her resounding talent, Karen also won The EcoChic Design Award 2013 Special Prize, as selected solely by renowned Artist, Sandy Lam. Along with Karen’s designs for Esprit, she will reconstruct a used outfit from Lam’s wardrobe for her to wear to in a photoshoot for Hong Kong Elle. Coming in second place and also proving a big hit with the audience with her wearable designs was second prize winner, France’s Louise de Testa. Louise bagged The EcoChic Design Award 2013 in Partnership with John Hardy. She will go on an educational trip to John Hardy’s design and production facilities in Bali to experience their sustainable design, production and business philosophies. As the 2013 cycle winners enjoy their well-designed victory, we’re now preparing for The EcoChic Design Award’s fifth cycle, which will open in April/May 2014. Stay tuned. Jessen created her looks using using secondhand jeans and T-shirt production surplus. Second-prize winner Louise de Testa. De Testa used jersey production leftovers to construct her outfits. Mainland China finalist Xinyan Da's collection. "Wildcard" finalist Clémentine Sandner's collection.